Metrolink, the second busiest transportation provider in Southern California, is continually developing marketing programs to retain and grow ridership. The I-5 South Corridor Improvement Project is a 7-year construction project, funded by Caltrans, to widen a seven mile corridor on the I-5 freeway in Southern California. Slated to begin in 2012, the project was certain to create a bottleneck of traffic for miles (and years). This unfortunate occurrence for drivers was a fortuitous marketing opportunity for Metrolink, a commuter rail system that runs along the interstate. A campaign was developed to target these commuters stuck in traffic and entice them to try commuting by train. Metrolink provides a critical service to southern California residents and workers in the five-county area and northern San Diego County in which it operates. Via its 7 rail lines and 61 stations, Metrolink’s 171 trains operate along 536 route miles owned by public agencies and 176 miles owned and dispatched by private freight railroads, transporting nearly 43,000 daily weekday riders and 20,000 weekend riders. The objective of the ongoing campaign is to lure commuters out of their cars and to experience commuting by train as an alternative means for getting to work. Studies have shown that Metrolink riders overwhelmingly find trains to be reliable and pleasant; however, most non-riders’ perception of train travel is the opposite — that it’s unreliable and unpleasant. So armed with research and determination, we developed ad campaigns for Metrolink designed to change that perspective by encouraging trial rides and doing our best to make the train look like the coolest way to commute in Southern California. The main objective of the campaign aligns with Metrolink’s strategic goal to retain and grow ridership, and increase revenue. Southern California is the epitome of car culture. So ingrained in the psyche of its people, cars first became the hallmark of life in the region during the 1920s and has continued to show up in California’s identity as a metaphor for fun, freedom and glamour for decades. Los Angeles itself was designed and built to be served by the automobile as can be seen in its sprawl. As the population has increased however, so has a need for public transportation. But how do we get people to leave their beloved cars and take the train? How do we change their perception and facilitate behavior change? Barriers to train travel cited in reports include lack of convenience, flexibility of having a car, and inconvenient station locations. Millennials are the largest demographic among Metrolink’s new riders. They’re not into cars as much as their forebearers. The vehicles’ meaning to personal identity and freedom are different for this generation. According to USA Today, 45% of millennials say they’ve consciously tried to replace driving with transportation alternatives — compared to 32% of older generations. Millennials also feel personal responsibility to make a difference in the world including reducing their carbon footprint. Based on this knowledge, it was clear to us that creating an integrated campaign targeting commuters along the I-5 corridor (primarily millennials) with appealing campaign creative and messaging — that public transportation is an attractive way to commute — would carry us across the finish line to meet our goals of ridership and revenue growth. Collaboration with the client is essential. Considerations included marketing objectives, target audiences, trial offers, tactical opportunities, and shifting from awareness to ridership. As the campaign entered new stages in its development, ongoing discussion, analysis, and new-media tactics were explored. All elements of the integrated campaign were orchestrated for the launch to have the greatest impact and were then expanded upon as the campaign progressed. Our strategy was to provide an integrated campaign incorporating electronic, billboard, print, mobile, media relations and social media tactics, built upon market research and designed to achieve a specified return on investment. Billboards would be placed along the freeway in view of commuters promoting a more pleasant alternative to sitting in traffic. Geo-targeted digital ads on Pandora, Gmail, WAZE, and Facebook would offer a “free ride” to encourage people to try their commute by train. Social media, YouTube and Vine videos would be created to attract millennials, garnering earned media and creating influencers for the brand. Traffic radio spots would remind those sitting in traffic that there was an alternative for commuting to work. Direct-to-home events such as postcards and doorhangers would also offer a free ride trial on Metrolink trains through specific geographic catchment areas that corresponded with the construction zones and nearby Metrolink stations. Reservation codes allowed for tracking the success of the promotions. A dedicated I-5 microsite would carry Metrolink’s I-5 messaging and provide up-to-date construction information. From the initial launch through each phase of the project, ongoing, focused collaboration and status reviews with Metrolink has been essential to ensure that marketing objectives are met, and that target audiences, trial offers and unique tactical opportunities continue to be addressed. RK Venture launched the I-5 Campaign with CHILLAX, a very direct, in-your-face, “stuck-in-your-car” relatable campaign that made significant use of social media, including Vines and YouTube videos, in addition to a robust media plan that included out-of-home, social media, radio, print advertising, and direct-to-home tactics. The initial launch featured highly visible, memorable billboards that utilized a construction sign motif with irreverent, unexpected messages. These strategically placed ads, seen throughout the construction zone, pushed the train as the sensible alternative to driving. In 2016, the graphics were refreshed with a new approach utilizing fun, graphic illustrations that tapped into the Southern California vibe showing the train with memorable riders – from zombies to surfers to business commuters -- forming the campaign we dubbed “Commute Altering”. These graphics, along with clever headlines and copy, gave a fun, whimsical feel to train travel that could be seen on the billboards along the freeway, and used throughout all the tactics and microsite. Additionally, we created an animated video showing a chipper Metrolink rider coming to work with her “zombie” co-workers. They’re confused as to why she’s in such a good mood and follow her out of the office and to a Metrolink train — the source of her happiness and fresh look on life. 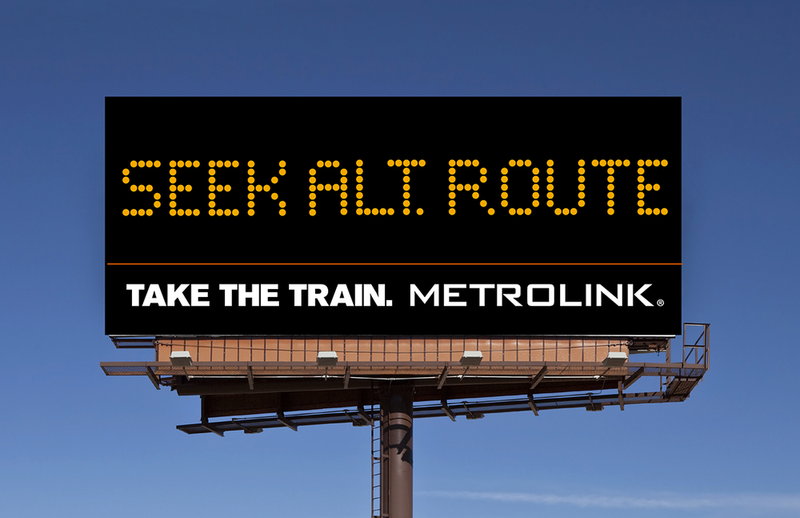 An accompanying campaign-specific microsite was developed to invite riders to “put themselves on Metrolink” via Metrolink.me, which expands the whimsy of the campaign by allowing users to create their own avatar and put themselves on the train alongside other Metrolink characters. The avatars and personal Metrolink.me videos could then be easily shared on social platforms. There have been marked increases in ridership, revenue and engagement for the Orange County and 91 Lines, the lines that run along the I-5 freeway. After the inception of the I-5 campaign, ridership increased 9.5% on those lines in the first year and has seen continued strong growth. The CHILLAX campaign’s use of social media, including Vines and YouTube videos attracted more than 20 million views and commensurate engagement within a two-week period. Digital campaigns have generated over 63 million impressions driving over 190,000 clicks for a 0.30% click-through rate, response rates that greatly exceed industry standards and client expectations. An integrated plan with multiple display publisher touch points maintained consistent CTRs throughout 2016. Traffic on the I-5 Microsite during the first four months after the inception of the campaign accounted for half the total traffic on the site over the last 20 months including page views (45%), unique page views (46%), entrances (50%), new visitors (48%) and returning visitors (56%). All direct-to-home events, including door hangers and postcards, produced response rates well above industry standards. Redemption rates from postcard drops reached 37.1%. Metrolink was able to retain 1 of 5 trial riders. Of those, Six percent of respondents have become new repeat Metrolink riders with 3.6% now riding several times a week and 2.2% riding 1-4 times per month. There has been high advertising recall by trial riders. Of those who tried the train, 60% recalled seeing the billboards and 13% recalled seeing the door hangers. None of the respondents had previously taken Metrolink. As the campaign extends through the years, good results continue. Ridership increased 7% in 2017 from 2016. Web traffic in July 2017 increased over the prior month by 13% in both page views and unique page views. Since the introduction of the 2017 campaign, the microsite continues to generate nearly twice as much traffic than when a campaign is not in market. Overall, Metrolink has seen ridership on all trains increase 10%, particularly in key demographics. This has occurred even as fuel prices have fallen. There has also been a 6000% increase of views on the Metrolink website. And Metrolink’s Facebook page now has more than 160,000 fans, the most of any train system in the country. The I-5 South animated video earned very high metrics in the first 6 weeks of its release garnering over 1.8 million impressions with 168,000 completed views.